Running The Bell Tolls last night for my local group. This will be an adventure I’ll run at conventions to playtest The Dee Sanction. I want to run this one in a single session, about 3 1/2 – and the version I ran bodes well for that. While we didn’t finish, we also didn’t play for 3 1/2 hours. What I did find is that it’s actually quite hard to support an investigation scenario in a way that considers some (if not all) of the bases. I had the core sketched out, but who was going to be following the mystery the same way I sketched it. In writing this adventure out for use by anyone else, I would need to give consideration to a few side treks and red herring paths. The players actually engaged in some pretty lively brainstorming on the solution and generally came up with some solid ideas. They also considered things I hadn’t, like the fact that people who do bad things – no matter how good their intentions – invariably need to be thrown in a cell and/or tortured/executed. This is Tudor England – rough justice is pretty much the order of the day where you have the wellbeing of the monarch under threat. In respect of the 214 system itself, not enough happened to give it any significant testing. We had about four rolls in the session, one a success, two a success by Teamwork, and one a success by personal effort. I believe I need to more firmly state the bounds – and indeed the existence – of a challenge. Just allowing the story to flow along leads to situations where I found asking for roll felt awkward – but that might just have been me. I think the scenario structure and game flow warrants defining clear challenges, whether social, physical, magickal or otherwise. I feel some boxed text coming on, with clear parameters about the situation and the degree of success required to overcome it. Faced with a wrongdoer stricken with panic and desperate to escape, you need to beat them in a 2-point Access Challenge to overcome their obstinance, for example. The custom dice worked well for me, but I didn’t explain their significance to the players. I think I just forgot about it until mid-way through the game, which is a shame. Given the trouble of creating them, it seems silly to forget them. They worked well for me, as I used the dice with the sigil to guide my story-telling for success and near failure alike. 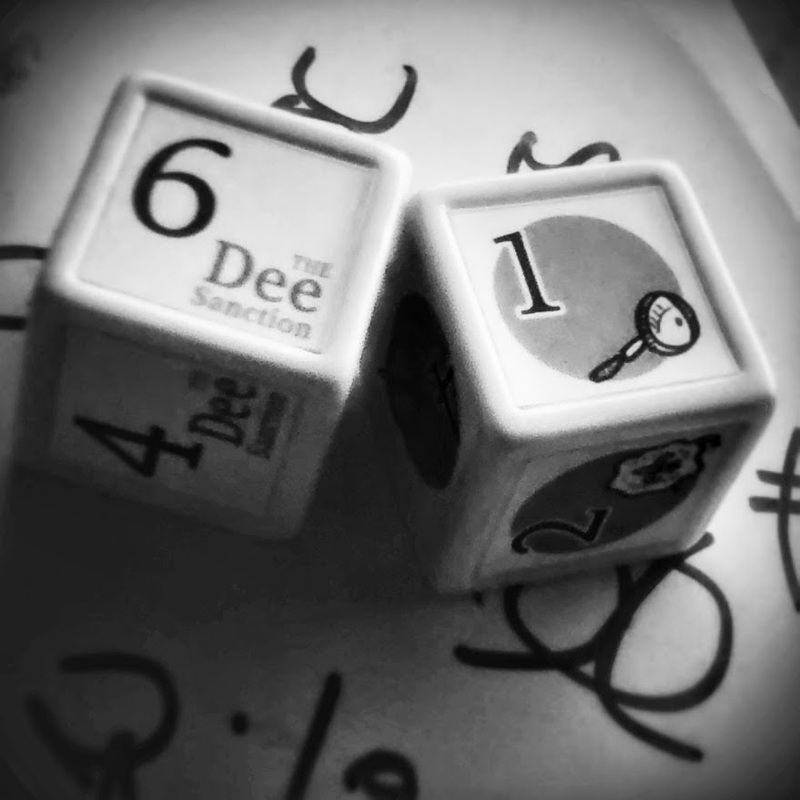 When one player looked to use esoteric scrying powers to determine the next step in the investigation, he used a card and rolled a 9 – one away from the success threshold of 6 to 8. Another player offered a point of Power to get the success and I noted the player roll showed a 3 – with a Magick sigil. 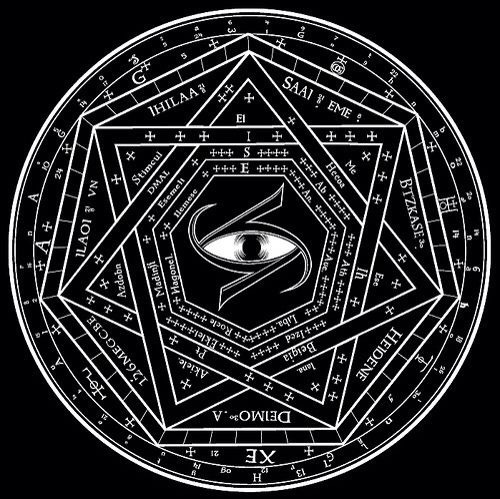 Despite the actual lack of magickal ability, the sigil suggested a success with hermetic overtones – so, I had the assisting character accidentally trip the rolling player up, at which point her sustained a head injury against the street that left him temporarily and inexplicably blind – as if suddenly trapped somewhere in total pitch darkness. A vision of the future or the solution, perhaps? I managed to fluff the progress of the adventure a couple of times by skipping something unintentionally and then not going back. The start of the adventure should have had the chance for some pressure, but I discounted it. Later, when I could have had a fight start, the characters found the aftermatch instead. I plan to correct that – given this is a playtest session – by rewinding to the start of the encounter again next session and running the more physical and action-orientated version of events. That’s assuming the players come back. I have asked for feedback, and I’ll see how that turns out. I can clearly see that for one-off and convention settings I need some tight and informative patter to get the setting across. You’re a band of investigators given powers by the Crown to investigate magickal and heretical threats to Queen Elizabeth and her dominion. Something like that. Random character generation – with the cards I prepared – provided the basis for some interesting characters, but I blustered straight into running the adventure. I needed to be more conscientious about giving the characters, and the players, some genuine context and background. The random cards actually meant that the combination of past career, magickal text and/or secret society jarred somewhat. It warrants discussion to determine a little about what dark deeds / actions might have forced the character to abandoned their profession and put themselves in harms way for the good of the nation. The Dee Sanction is not the easy option. Faced with heretics, witches and the daemonic, the likely end for most will be a gruesome one… at least if the Gamemaster can pull his finger out and get a battle going!